Many of my Memorial Day’s were spent racing the Tour of Sommerville, a 50-mile criterium in New Jersey, one of the oldest races in the U.S. The pace was blistering fast with plenty of crashes, bumping elbows and jostling for position. It was something I could do because others had fought and died for the freedom that allowed it. Your job is far from over. On Thursday it felt like the first day of summer with the air dewy sweet and warm and I biked into work and noticed that my cleat position was off by a millimeter or two which might explain why my left calf kept tightening up and why I mark all these settings and positions so I can tell quickly if something has changed, though in this case it took me a while to notice and do something about it when I noticed it at work, so I popped out the multi-tool and set about fixing the cleat position so that a short time later when I was getting on the bike in the heat of the setting sun for my ride home it felt all right again, even as I rolled down the hill before I had started to apply power and even better once I was on the long climb up Pine Hill Road and marveling at the difference a mere millimeter can make and marveling again at how this still surprises me twenty seven years after I started on the bike, after the first awkward pedal strokes, crashes, hills climbed and descended, races won and lost, saddles slipped and cleats askew, lessons learned and mistakes repeated again and again, so that on the warm Thursday in May where it felt like the first day of summer, I carried those lessons into the ad-hoc sprint workout I had decided to do on the way home, ten or more sprints and some extra distance above and beyond the forty kilometers I would have typically done for a commute, sprinting for the distance between one or two telephone poles, short burts of speed and turns of the pedals in a 53×17, mostly on a slight downhill to aid in the acceleration, sometimes on an uphill for power, remembering to relax my shoulders and upper body after the first two or three, appreciating the stiffness and solidity of the carbon fiber bike beneath me, the resilience in my legs, the warmth in the air, the way the sun spilled through the new leaves of the trees by Heard Pond where I peaked above fifty kilometers an hour and dodged potholes and avoided going down while the speed ebbed and I caught my breath, recovered, then did again and again, spacing them out along the run home, past green lawns filles with children playing as if they had all suddenly appeared like the leaves on the trees, appeared with olders sisters and young mothers wrapped in summer dresses lounging lazily on porches and lawn chairs, flashing brief smiles as I rolled by, kids waving and dogs pursuing as I rolled by, my head down and rocking the bike back and forth, while I sprinted by, finally losing count of the number of sprints, finally rolling through town and down the side streets, not wanting the ride to end despite the failing daylight, still wanting to run on and on. 80+ km on the bike on Saturday and a 10 mile run on Sunday — I was ready for something calorie-rich. 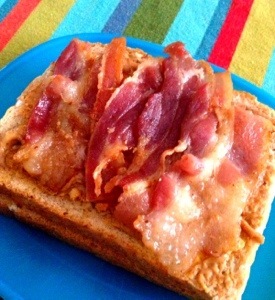 I normally suffice with the peanut butter and honey but some left over bacon — reheated in the toaster oven — added an extra layer of goodness. 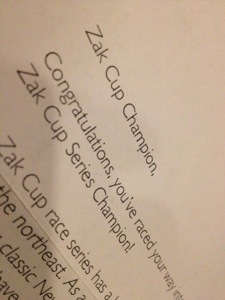 I won my age group in the Zak Cup this past ski season. It may not say much about the depth of competition in my age group but I still had to compete in all those races and finish in the top of my class. Thank you NENSA and LL Bean! Al Fritz, the creator of the Schwinn Sting-Ray, passed away last week. The Sting-Ray was my first two-wheeler. Mine was metallic blue with sparkle grips and banana seat. I rode it everywhere. Sometimes it was a horse when I was cowboy, sometimes a Jeep when I was in the Army. 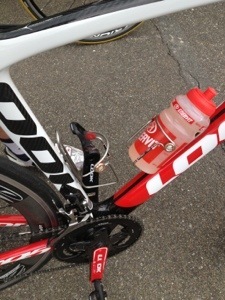 Sometimes it was just a bike that I raced with my friends in the neighborhood. The Sting-Ray started my lifelong love affair with bicycles.